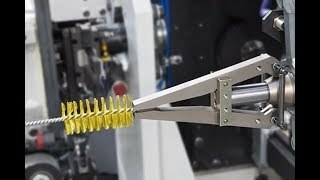 U TWIST is the ultimate solution for the production of twisted brushes with loop end or closed end. The machine consists of 2 working stations: one station carries out the first twisting while the other one does the fine twisting and finishing of the brush. Working simultaneously on 2 brushes at the same time, the 2 stations ensure a tremendous output of finished brushes. Easy programming of new models and the fast set-up time make the machine extremely versatile and efficient.